I raised takes after making everyone love me, made sure my infrastructure was built up, and when I went a-conquering, I checked out their income stats first. I also got lucky in several protracted wars, and took a few ransoms for 75g each early on. If you are performing activities which genuinely need lots of money, like wars and building, they tend to get you the income you need to pay it off. I spent a few months sliding in and out of bankruptcy at one point, but then I got my economy rolling and everything picked up pace. Hungary it is. Éljen a Magyar!! EDIT: So I am now the count of Pest, and knowing nothing about Hungarian history, had my troops aiding the king in a holy war when the country exploded in civil war. Luckily we changed history and the king won, granting me a nice little duchy. In the space of 20 years, there have been about 4 revolts, 5 wars for deposition/independence/succession, and now the Croatians are invading in an excommunication war. I am pretty much the only duke not abandoning the king, and he still dislikes me, so I'm considering breaking away from him, and possibly swearing fealty to Croatia. Only problem is most of my levies have been used up zooming around Hungary defeating the pretenders. The Duchy of Pest does not seem to be a fun place in the late 11th century. And the new Kaiser does NOT like me. Probably because he's an arbitrary craven drunkard lusting clubfoot.. I predict a war in the next few years, there are some claims on northern france from Holland, and a claim on Toulouse from Provence. If we can call in ALL our of combined allies, it's going to get pretty ugly. Finally managed to make the Duchy of Volhenia the Kingdom of Poland. Gathered enough titles, after dozens of bloody wars and rebellions, and i finally usurped the Polish title. I can finally give out the duchies now! 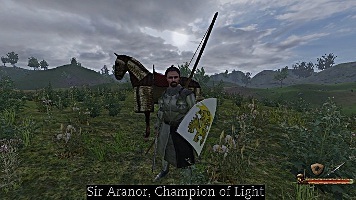 Mount and Blade game-play w/ some total war/crusader kings II strategy and I would be gone for weeks. Varys i was just watching game of thrones again and just realised where u got inspiration for your character, but why be a eunich? Game baffles me. 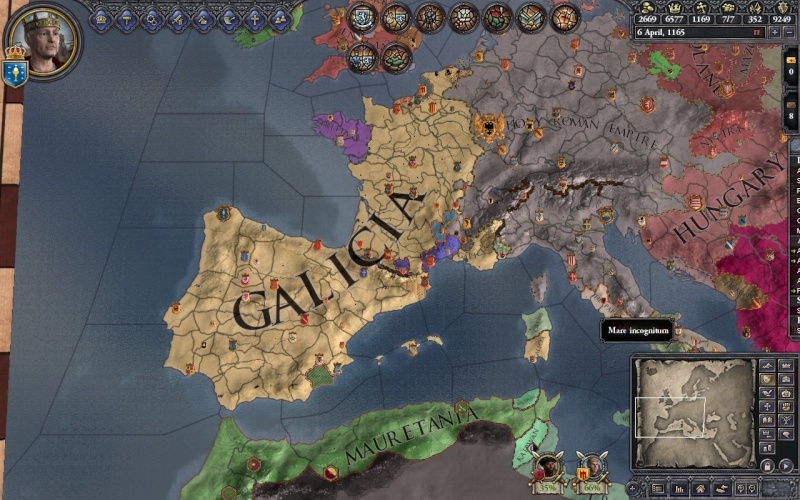 Beja practically owns the entire Iberian peninsula but some two county owning count just killed 20K of their men then they turn around and massacre Galacia which is three maybe four times that size. That count must be one holy dude because he must have had more than one knighthood order. After a few generations planning, I finally usurped the crown of Hungary, and was immediately launched into wars with multiple claimants. I ceded a province to Croatia, and then found myself being attacked by an alliance of about 15 Byzantine states. I held them off until they called for a white peace, and then the old Hungarian King attacked me, then my brother tried to steal the throne, and to top it all off, the Byzantine states attacked me again. I beat the Hungarians, but was forced to surrender to the Byzantines. I noticed that the disputed counties were still in my lands. Then I noticed that my demense was smaller. Then I noticed that I own about a third of Greece. Awesome! So it turns out that while my enemy now owns some of my counties, he is now my vassal, increasing my revenue and troops! Who else is excited for Iron Sky coming out? Being attacked by the HRE within a year of succeeding to France, but they are next on my list, if I find I have a claim on them. If not, Brittany is mine. Of course, it's all going to fall apart on my death, I have played 2 characters so far. The starting king murdered both his brothers to claim their thrones, took the entire of northern Iberia in ducal claims against the muslims, and married a French princess whose other children owned about a quarter of France. My next king conquered the ret of Iberia, and started on France, before I saw that his mother had a claim on the entire kingdom. Took it in about 2 years, and that is what you see here. The war against HRE is not going well, but my armies are badly positioned for when they bring in 20,000 strong formations. My best troops are coming up through Iberia from a holy war (the little green province SE) so I should win with a bit of luck. Define "that"? The game? The nation? The meaning of life? 42, or optionally the answer given in the respective Monty Python film. Oh god, it's gone wrong. King Ramirez II fought off the HRE, took Brittany, and died about a month after. King Ramirez III had to deal with two dukes attempting independence, but defeated them, then died, leaving his seven year-old son, Ramirez Ramirezez (honestly, I haven't named anyone here) as King Ramirez IV, and about half my kingdom/empire is suddenly reaching for independence. Every time I reallocate an army after crushing one duke, two more pop up, usually followed by a duke I beat down earlier. I'm stopping for today, but I'm not actually sure I can keep it together. I took the County of Strathcyle to lead the most advanced (westerner), richest and largest military nation in the world. Was a great game though, the Moors wiped our Spain and France (The entire kingdom is gone, just Normandy, and the central part of France are owned by England / Scotland respectly), and they now have borders with the HRE, and stretch all the way to the English channel owning Flanders and Brittany. Meanwhile, Egypt wiped out the Byzantines and took the Balkans all the way to Vienna. They also own 3/4 of Italy, including Rome. The Pope is relegated to a handful of Baronies. The Hordes collectively wiped out the whole of Russia, and Poland, and were only stopped by Sweden in the North and the HRE in the west. The HRE turned Francelli for about a century, spawning numerous crusades against them. Scotland is Scottish, Wales is Scottish, the English South Coast is Connacht while Yorkshire and the East Coast are Irish, with York being the Irish capital. Britain and Scandinavia were for a time the only Catholic nations left. I'm also involved with the CK2 to EU3 converter project, and I fully intend to take this state of affairs to EU3. The wars for Christendom will be epic! I love the games where Christendom is threatened. I think I'm going to start a game as Scotland and covert my leader to a Pagan religion then shift the whole Kingdom over. Should be fun. Victoria II is an amazing game, however it takes forever to get into. CKII is still my absolute favourite, though.